I was looking out for a notification from LU, which appears in my email when a new post is posted. I did not get it this time. But I checked anyway, and found a reply from you. Does this happen sometimes. Anyway, I close my eyes and hearing is happening. When I try to locate it, there is nothing tangible there. Even when I open my eyes it is the same. When I try to find the I that is hearing, I find emptiness. However, I had been doing a practice called awareness of awareness, and I would feel like a vast empty space with that practice. My mind is throwing in doubts that I am imagining and am deducing from previously read teachings which say that you are emptiness. My mind is very quick to switch attention from the real to the imagined. When I try to close my eyes and see what it in front of my eyes (the darkness or whatever color appears), my mind sometimes very quickly switches to visual thoughts and imagined things. Is there a way to switch off this perception of imagined things? I posted a reply and I cannot see it now. This is a test post to ensure that this gets posted. My mistake, I was looking on page 1. My reply to your post is just below your post. Yes, but it's rare. I usually answer quickly although in the weekends I can have less time to reply. I'm going to be a little picky here. Do you really find emptiness? Or are you using the word emptiness because you're assuming that that is what you should find? Are you experiencing such a thing as emptiness right now? Is it possible to see the absence of the self? Or even emptiness? That's because you are! I understand what you are saying when you talk about emptiness and felling a vast empty space (I can relate with your words) but they sound a little like second hand knowledge. Don't read my words as being criticism, they aren't! I think it's great that you are aware of what is going on. Well, I think that when you focus on the senses instead of focusing in thoughts you are perceiving things that aren't imaginary. It is normal to imagine things. Do you expect to have control over thoughts? Have you been looking for a self? A self that isn't imaginary? How is this search going? I did not receive a notification again, and I have written to the admin, so hopefully they will sort it out. I appreciate the time you are taking to write to me, whenever you are able to do so. Do you really find emptiness? Or are you using the word emptiness because you're assuming that that is what you should find? Are you experiencing such a thing as emptiness right now? Is it possible to see the absence of the self? Or even emptiness? When I close my eyes, I see darkness and feel sensation. When I close my eyes and try to locate the "I" or to locate the entity that is listening, I find the same thing: darkness and sensation, wherever I look and place my attention. i have been calling this emptiness. it feels like darkness and sensation, thats all. In fact, I have tried many times to locate the I in various ways, and I always find darkness and sensation. Nothing more, nothing less. It is not possible to see the absence of something, without using thought and memory. so if we just go by what we see, we can't see what is not there, so we cannot see the absence of a self. I agree with this and it fits with my experience. From your answers it seems you can't find a self when you focus inside. Is this the case? I would like you to do something different next. I would like you to look for a self outside, walking in the street. This may be a little tricky but it can be also very fun. Notice if you can find a self that is separated from what surrounds you. Try to find borders between you and all the rest. See if you are in any way separated from all there is. Let me know if you have doubts about what I'm asking you to do. Notice if you can find a self that is separated from what surrounds you. I see everything else as separate from me, and i am looking at everything. but if i cannot find an "i", how can i find a dividing line between the i and everything else. its confusing and frustrating because even my hand does not feel like an "i". the "i" feels like it is looking out through these eyes. it feels unpleasant to do this exercise for some reason. It is possible that the unpleasantness, the confusion and the frustration are part of a protective mechanism that is triggered because you fear what you may find out or not being able do do what you are being asked to do. Are you afraid of something? When a emotion arises maybe you can try to check if there is a you feeling that emotion. Notice what happens when you become aware that this you can't be found. Do you want to continue with this exercise or would you prefer if we move forward? What can you see exactly that lets you know you are seeing everything else separate from you? Are you seeing seams, borders, dividing lines? I will need a few days to reply, due to unavoidable reasons. Okay, thank you for letting me know. Hope you are doing well. Thank you for giving me a few days to respond. This exercise has been frustrating. I feel that the "outside" is separate from "me", but when i look for a dividing line, i cannot find it. 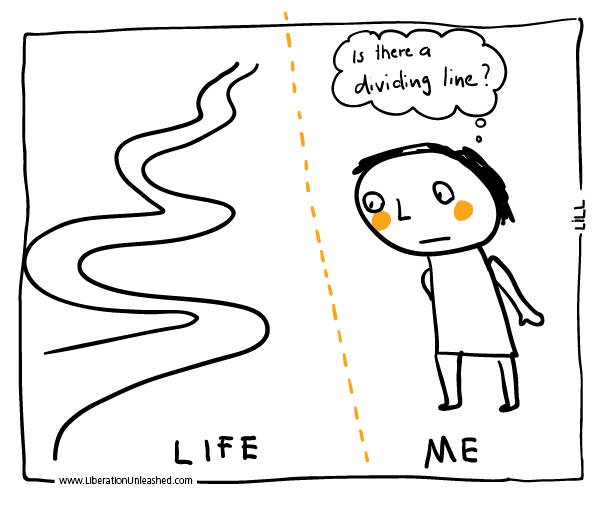 where is the dividing line? the body was an answer, because i can feel what happens to my body but i cannot feel the sensation of breeze on a tree. You ask if it is fear, it feels like frustration. My mind is throwing up doubts and criticisms such as "this is a waste of time, it will not succeed", "this is an intellectual exercise, you are still using the mind" etc. I will try to ignore these doubts and continue, but can we find a different route to explore? Let's check what the mind has to say about this. Let's assume a separate, independent, long lasting, solid you is real. Let's assume a separate, independent, long lasting, solid you is real. What is this you? If we assume a separate, solid you is real, what is this you? The I is a composite of the body and the mind. The body is the physical form, and the mind is the non-physical form. The mind is a thinking analyzing entity that processes thoughts that appear and emotions that appear. The thoughts and emotions are not part of the mind but occur to the mind. Just like food is consumed by the body, the mind processes the thoughts and emotions and controls what happens to my life. The solid I can exist without parts of the body but needs to body to exist. The I also needs the mind to control the body and give direction to life. Hi S, thank you for your answer. The solid I can exist without parts of the body but needs to body to exist. The body is here yes. But where is the I? Is body = you? Or is the body a body? The thoughts and emotions are not part of the mind but occur to the mind. Is mind more than a bunch of thoughts popping up one at a time? What makes you say thoughts are a you? The I also needs the mind to control the body and give direction to life. Do you have to think all the time so that the body can function? The eyes are always blinking. Are thoughts needed for the eyes to blink? The body is here. I try to find the I, and i cannot find a solid entity. It is more like a feeling of "I-ness". Is the body me? Well, the body may be a part of me. I certainly don't know any time where I did not have this body. Just like the "I", there is no solid entity I can point to and say it is the mind. There is a lot of analysis that goes on, which may be the mind, but the analysis is thoughts as well. So maybe the mind is a series of thoughts. but taking something as simple as cold medicine changes the way and extent of what i think, so I don't know. there may be a physical basis for the types and amount of thoughts I perceive. I don't feel that thoughts are me. They are something that occur to me. There seem to be a whole lot of automatic functions that this body performs without me having to think or analyze, but that could be an automaton-type programming. At least that is what occurs to me as an explanation.